Home › Australian Politics › Candice Lester versus Andrew Leigh, first round knockout to Candice. Candice Lester versus Andrew Leigh, first round knockout to Candice. My good friend at Crusader Rabbit reckons I am mad, but due to my interest in global politics, I watch the ABC show Q and A most times its on. He’s right in that its basically a communist propaganda show, but it has enormous influence across Australia and I think one has to stay abreast of what the enemy is thinking. Its always grossly biased against the right and or the Australian Liberal Party. The host Tony Jones is an extreme left winger. Its panel, apart from the obligatory token rightists, is always stacked with the worst kind of socialist rabble. Its audience is mostly the same. The questions are an almost unremitting barrage of left wing garbage based on unrealistic premises. The tweets that slide across the screen as the show goes on are mostly excruciatingly painful in their low IQ half educated Marxist origins. I shouldn’t watch for all it is really is a sad reminder of just how deeply embedded Marxism is in a large sector of Australian society. However last night the unthinkable happened. An audience member slipped through all of the filters and asked left wing golden boy Andrew Leigh, shadow (Labor) assistant treasurer a great question. Andrew Leigh, you have said that, and I quote, the “ideal Medicare model involves a small co-payment”, that Australian universities should be “free to set fees according to the market value of their degrees,” that large government handouts “visit suffering and exclusion on those very people in need of assistance,” and that regarding pension ages, “70 is the new 64.” However you are now voting against the very Government proposals that address these concerns. Would you say you’ve sold you soul? Or simply changed your mind? And if you’ve changed your mind, why? At first stuck for words, Andrew then gave a long speech that didn’t really address the complete reversal of his position. The full exchange is here. When he had finished waffling, Candice hit him again. I guess I want you to expand on your response that, you know, these are kind of four topical issues that affect a lot of Australians. You’ve now come over and you are supporting the Coalition, I guess, are you likely to change your mind on those issues again before the next election? Again Andrew Leigh was lost. He had no answer that could excuse him from arrant hypocrisy. Again we see how the left flounder on the rare occasions they are put under some real scrutiny. Its no wonder they mostly do all they can to avoid it. I hope Candice is in Liberal Party politics. She could have a great career. You can watch Q and A streamed on the net or download if from here. 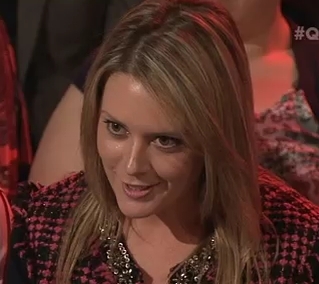 Fairfax “political journalist” Jo Moir- lazy or biased? Good grief! Q&A must be slipping. The only times I’ve watched it (mercifully few) it resembled nothing so much as the ritual stoning of the village demon aka conservative guests. That tolerance was tested last night. The audience’s fawning over some vapid communist actor was so bad I had to keep a bucket next to me. It’s a sad indictment of your brand of far right reactionary politics that you see anything closer to the centre than fascism as being communism. Your failed ideology is proof the evolution isn’t working fast enough. I hope for the sake of the planet you never have children. You are a traitor to the values your country holds dear. Really, who with any intelligence would leave such a pointless message?